A couple of years ago, I got The Gourmet Cookie Book for Christmas. I immediately loved the book just for its stunningly elegant graphic design. It’s a book worth having, even if you never make a single recipe out of it, because it is a piece of art all by itself. It took me a while to get around to making the cookies, but every recipe I’ve tried has been good so far. Gradually add the flour mixture to the butter mixture, stirring until it is well combined. Form the dough into a ball and knead on a well floured board. Roll into a rectangle ¼-inch thick, and cut into rectangles 2 ½ inches by 1 ½ inches with a knife or cutter (I used my bench scraper, and it did a lovely job). 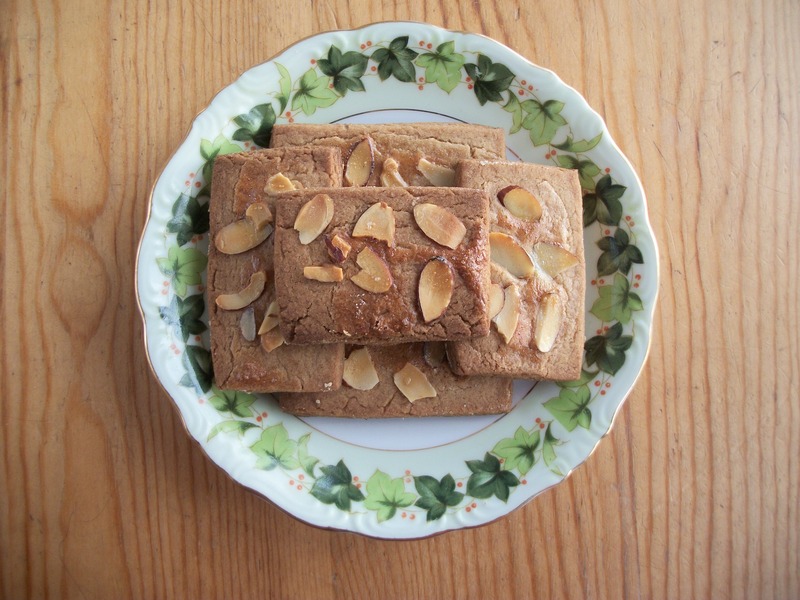 Place the rectangles on a buttered cookie sheet, decorate with blanched almonds, halved or slivered (press the almonds gently into the dough), and brush them with lightly beaten egg white. Bake at 375°F for 12 to 15 minutes, or until browned and firm.